The Caribbean is a melting pot of cultures, people, and traditions. But Jamaica is credited with the birth of a genre of music that is said to have encompassed the world, and we call it reggae. While the original messengers and prophets of the sound of reggae, such as Bob Marley, Peter Tosh, Dennis Brown and Garnet Silk, are no longer with us, modern day musicians are taking on the mantle of spreading those sounds. The Uprising Roots Band, often noted as one of the more authentic reggae roots bands in Jamaica, continues to spread the sounds and positive vibrations of reggae music through their songs and performances all over the world. The band is readying to release their debut album later this year, something that the entire Uprising Roots Band family is excited about. 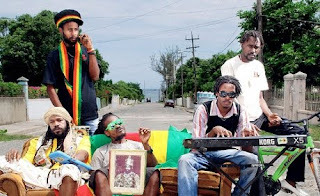 From their east Kingston studio, the band has released three singles which are enjoying regular rotation in reggae-loving regions of the Caribbean, Europe and North America. The singles, Brightest Light, Skyfiya, and Know Yourself are shining examples of what the band is all about. A five-piece-Rastafarian outfit, the band remains true to their love of music - which dummer and lead vocalist Rashawn 'Blackush' McAnuff says is an integral part of their formula for success. "Everybody in the band loves music. Just the sounds that come out of the instruments and the way we, as a group, can make that work and make those sounds into music. That, for us, is what everything is all about," McAnuff said.